This article submitted by Linda Stelling on 6/14/00. Two former Lake Henry students, Mary Ann Meyer and John Horn had talked about holding a school reunion for years. The two had attended the school together for eight years. In 1951, they were the only fourth graders in the school. They decided to hold the reunion while the older students in the area were still around. About 275 former students and teachers will gather to reminisce about their school days in Lake Henry at an all school reunion on Saturday, June 24, at the Lake Henry Lions Park. The school was a part of the community for 85 years. A social hour will start at 1 p.m. with a program planned for 2 p.m. A pork chop supper will be served at 5 p.m. and a polka mass is scheduled for 8 p.m. Organizing the reunion are: John and Mary Horn, Bill and Martha Hopfer, Alvin and Mary Ann Meyer, Jim and Sue Brick, Ruth Kraemer, Kathleen Wuertz, and James and Mary Ann Fasbender. Two of the committee members are former teachers who married local men and stayed in the area: Kathleen Wuertz and Ruth Kraemer. A one-room school opened in Lake Henry in 1886 as District 131. The first school was located north of St. Margaret's Catholic Church. The building was moved down the road when the new school was built. It no longer is in existence. 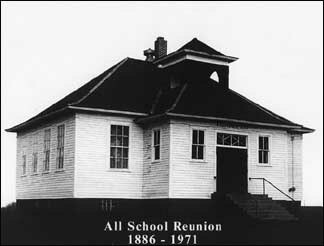 In 1908, a two-room school was erected across the road from the church. 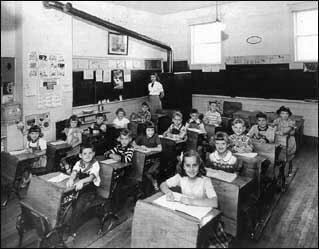 The smaller room was the classroom for the first through fourth graders while the older students, in grades five through eight, held class in the "big room." Later, the school was changed to six grades. The Sisters of St. Benedict staffed the public school until 1939. After that, lay teachers taught at the school. In 1951, the school was remodeled. A basement was added to the building. An indoor bathroom and furnace were installed in the basement. In the early 1960s, the school district's number changed to 2023. It is difficult to tell how many students attended school in Lake Henry as the records of the school have been lost and can't be found. The last group of students to attend Lake Henry were: Dennis Meyer, Rob Meyer, Mark and Deb Loxtercamp, Joyce Jaeger, Pete Hopfer, Donna Meyer Welle, Mary Ann Fuchs Spanier, Dan Fuchs, Cindy Hess, and Scott Weidner. Weidner said he had a lot of great memories of the school. Wuertz was his teacher five out of the six years he attended the school. "We had three grades in each room. When it was our grade's turn for a lesson, we would walk up to a table at the front of the room," he said. The school closed in 1971 at the direction of the state. Many of the students attended school in Paynesville while others went to Belgrade. After the school closed, St. Margaret's Catholic Church purchased the school building and used it for religion classes. In 1981, Norman Bork purchased the school and moved the structure to Bork Lumber near Paynesville. The building collapsed in 1999 and was removed. Wuertz started teaching in 1938. She came to Lake Henry in 1942 and stayed in the area. She taught in various country schools a total of 31 years before retiring. Then she did substitute teaching another 10 years. Wuertz taught 16 years in Lake Henry. Wuertz recalls having to be at school before 7:30 a.m. to get the fire started in the coal stoves. Wuertz explained it was the responsibility of the teacher in the upper grades to stoke the fires in both rooms. Students recall when the furnace went out at the school, they went over to her house where it was warm and watched film strips. Wuertz said the state department told them in the 1930s they didn't need to teach phonics. "I taught it anyway because all the schools we visited during our teacher training were using phonics," she added. She credits phonics as to why her students did so well in reading and spelling. Wuertz would go outside and pitch for the student's ball games during recess. She even umpired a few games. When the students complained about her calls, she had each one take turns umpiring. They soon found out it was harder than they thought, Wuertz said. Hugo Lieser, 89, the oldest living student who attended Lake Henry, recalls helping bring coal in from the shed behind the school. At the end of the school day they would have to bring in enough coal for the next day. From a home next door, the older boys had to carry water to the school each morning to fill the water fountain. According to Lieser, the students were required to attend mass every morning before school. The older students helped serve mass. Once a week the priest would come into the school to teach religion. "I only went to school eight years. Then the boys stayed home and worked on the farm instead of continuing their education," Lieser said. Lieser also remembers the long walk to school. He and his brothers and sisters had to walk two and a half miles in all kinds of weather. In the winter, when the water was frozen, they crossed Lake Henry which shortened their trip to school. An average day in a small country school was at the mercy of the weather. Country students and the teacher had to face icy winds walking to school or if they were lucky, getting a sleigh ride during the winter. When travel during a snowstorm was impossible, the teacher spent the night at the school with the students. When the students arrived, some had frost damage to their hands, feet, or face and were treated by the teacher. While tending to the students, the teacher also had to keep the fire in the big stove burning to bring the temperature in the room above freezing. Pictured are students in 1951-52: (far row, front to back): Pat (Hess) Vagle, Mary Ann (Meyer) Bauer, James Wuertz, Ruth Ann Wagner, Paul Lieser; (center row): Robert Wuertz, Francis Horn, Cyrilla (Lieser) Michael, LuVerne Horn, Florian Wuertz, Ron Hess; (right row): Betty Lou (Hemmesch) Backes, Cecile Wagner, James Fischbach, John Horn, and Mary Ann (Lieser) Meyer. On a cold winter day, during recess, the older boys would bring in coal while others headed over to a neighbor's well to fetch water. A couple boys would also be out shoveling a path to the outhouse in the back. During the typical school day, the first and second graders worked on their numbers while the third and fourth graders did arithmetic. Once arithmetic was completed, the students worked on spelling, penmanship, and geography until noon. Reading and English for every grade was heard from 1 to 2:30 p.m. At 2:45 p.m., history, physiology, health, more reading, and miscellaneous help for as many as 24 students was completed. The teacher was in charge of whatever needed to be done, from tending the wood stove to seeing students were dressed appropriately for the weather before heading home. The students had the advantage of learning from all grades in their room, regardless of age.